Mary Jo Yackley, nationally known quilter & teacher, will be featured speaker at the Quilters Guild of Southern Crescent (QGSC) meeting on Thu. Sept. 22, 7pm at First Presbyterian Church in Fayetteville. Her talk will be on the development of applique over the years and improving fabric selection for your current applique project. On Fri. Sept. 23 (9:30-4:30pm) Yackley will lead a 1 day class on fabric painting. This will be a hands-on workshop where students will leave with 3 yards of painted fabric; so come dressed to have fun! Class fee is $25 plus kit fee (including all fabric, paint, brushes, etc.) of $55. September 26 Mary Ellen Van Holt "Color Plan Your Quilts"
October 17 Laura Bosma, "Pretty Penny Precuts"
Coming Soon: Block of the Month! Common Threads Quilt Guild is 10 years old! On August 22 the guild celebrated it's 10th Birthday! 10 years of fun, friendship, compassion sewing and learning new skills. A good time was had by all. Food, friends and beautiful quilts filled the Mills Baptist Gymnasium. 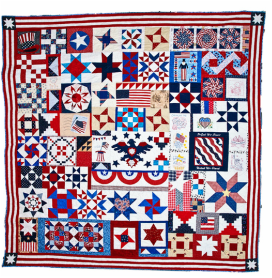 Formed in 2006 by a handful of quilters, the guild now numbers over 80 members who are devoted to the art of quilting. Community service is an important objective of the guild. Members meet to create quilts for homeless veterans housed at Ft. McPherson, quilts and pillowcases for the Welcome House and Angel’s House, quilts and burp cloths for the Coweta Pregnancy Center, as well as quilts for the families of fallen soldiers of Coweta County. The guild meets on the fourth Monday of the month from 7 pm to 9 pm at the Mills Chapel Baptist Church. Quilters are invited to visit our meetings as guests to learn more about the guild. Way to go ladies! This year's Raffle Quilt is awesome! Thanks to all of you for contributing such beautiful patriotic blocks. Tickets are on sale now! I know I cannot wait to buy mine! Drawing will be at November meeting so get your tickets now.